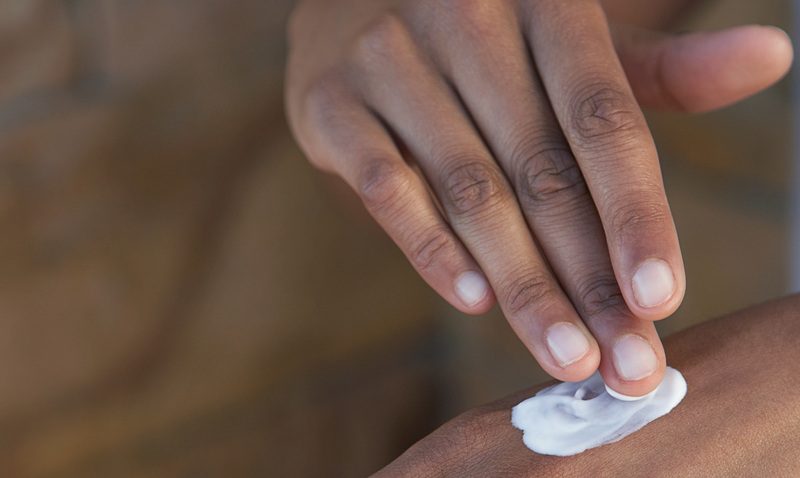 Imported Skin Creams Can Pose Unexpected Health Risks : Shots - Health News Doctors were surprised to find a patient using a powerful steroid cream bought without a prescription at an African store in Washington, D.C. It was also easy to buy online. A dermatologist in Washington, D.C., was surprised to discover that one of her patients was using a powerful steroid cream bought without a prescription to treat a rash. It turns out that the patient and the patient's family, who are from Africa, bought the cream, called Funbact-A, at a local store focused on African goods. It contained betamethasone, a high-strength steroid sold only by prescription in the U.S. Though high-dose steroids are often used to treat skin conditions, they can cause problems including skin atrophy, acne, severe rashes, infections and systemic reactions. This cream, and other steroid creams like it, are often marketed to women in Africa and Asia to treat acne and lighten skin, although they and other treatments have been banned in some like Ghana and Ivory Coast owing to health concerns. Dr. Cynthia Marie Carver DeKlotz, the pediatric and adult dermatologist at Medstar Washington Hospital Center and Medstar Georgetown University Hospital who first treated the patient, and her colleagues reported the product to the Food and Drug Administration. They also found it being sold on Amazon and reported it to the giant retailer; it is no longer sold through the site. The patient hadn't been using the cream for long before doctors intervened and didn't experience any damaging side effects. The doctors reported on the case Wednesday in JAMA Dermatology. DeKlotz talked with Shots about the case and the issues it raises. This interview has been edited for length and clarity. It sounds like you and your colleagues were really worried when you realized a patient had been using a high-strength steroid on their own. How did you find out? It took a little bit of prodding, but then we were able to get from the family that they had purchased a product at a local store ... that in their minds, wasn't anything harmful. We decided to look into it more and found out, Googling and on Amazon, oh wow, you could just go online and purchase this and have it shipped to your house, no problem. Thankfully in our patient there were no serious side effects, but if a product like this is so easily accessible to anyone that can get on the Internet in the United States, who knows what sort of reactions people could be having, and they're not even aware of it. What led you to decide you needed to get the word out? One was the cultural component to it. This family, it seemed like it was in their minds just a normal occurrence to go to their local African store, pick up these creams that everyone back home was using, and to use them without any sort of sense that there could be any harm being done. We all have different cultural backgrounds, and we have to try to understand different patients' and individuals' cultural experiences so we can help figure out what's going to be the best health care treatment for them, and that they feel comfortable discussing different cultural treatments with us. The second was that we found when we were looking online how easily accessible the product was to purchase. It made us concerned that maybe many patients are using this without any monitoring by a health care provider, and we wanted to bring to light the fact that this potentially could be harming people. One issue here seems to be that countries have different approaches to regulating access to medications, with the U.S. requiring a doctor's prescription for drugs that can be bought over the counter elsewhere. Are people aware of the risk? Unfortunately, I do not think people are aware of potential risk. You can go to numerous other online sites and purchase these things. But those sites aren't required then to have anything posted about warnings, because it's either not located in the United States where it's under FDA regulation, or it's just being done not in the proper channels. How can people reduce their own risk of buying an unsafe product? I encourage all individuals to discuss with their health care providers whatever products they are using, taking, putting on their skin, taking by mouth. That includes vitamins, herbals, creams, lotions, washes — bring it to the attention of their health care provider so they can determine if it's appropriate for them, if it's beneficial and helpful, and if it potentially could be harming them. On the flip side, I hope that all health care providers ask their patients what they're using, and really take the time to find out. Greta Jochem is an intern on NPR's science desk.